BANGI, 20 October 2014 – Scientists at The National University of Malaysia (UKM) researching cancer cells, microbes and roundworms in space during and after the Angkasawan programme in 2007 need specialised equipment on earth to continue their experiments. 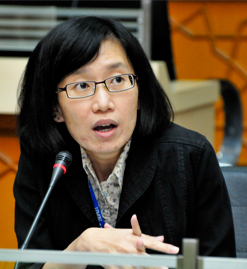 One of the project researchers Dr Neoh Hui Min said they need a three-dimensional micro-gravity simulator to simulate the effects of zero-gravity so that they can do the experiments at their Space Science Research laboratory at UKM’s Medical Molecular Biology Institute (UMBI). She was speaking at a meeting between Malaysian scientists and Dr Chiaki Mukai, Japan’s first woman astronaut and the Director of Japan Aerospace Exploration Agency’s (JAXA) Centre for Applied Space Medicine and Human Research, in conjunction with the seventh National Astronaut Day celebrations here today. Dr Neoh asked whether the Japanese might be interested in assisting by having joint research projects with UMBI. Present at the meeting was Dato’ Dr Sheikh Muszaphar Shukor Sheikh Mustapha, Malaysia’s first astronaut who helped undertake part of the experiments on cancer cells and microbes in space when he went to the International Space Station (ISS) in 2007. She said the UKM researchers want to continue experiments on the effects of simulated microgravity on gene expression profile and biological phenotype of Caenorhabditis elegans. Caenorhabditis elegans is a small, free-living soil nematode (roundworm) that lives in many parts of the world and feeds on microbes. It is an important model system for biological research such as genomics, cell biology, neuroscience and aging. Instead of doing experiments on higher animals, Dr Neoh explained that the roundworm has a lot of advantages, such as a short life cycle, compact genome, stereotypical development, ease of propagation and small size. Moreover, the whole genome of C. elegans have been sequenced which made the task easier. She said they want to find out more about gene expression, changes of genes involved in longevity, DNA repair and locomotion and the possible impact on future long term space flight and planetary exploration. Even if they don’t have the chance to go out in space, they can at least do further experiments at UKM with a micro-gravity simulator. Apart from equipment to simulate microgravity on earth, the researchers have to control life stages of C. elegans in a single generation for accurate gene expression and to carry out experiments conducted on both agar-agar and liquid medium. UMBI’s C. elegans in space research had actually started in 2006 as a collaboration between UKM scientists with the University of Pittsburgh and the biotechnology company Bioserve in Colorado. The experiments were done by UMBI’s research partners in space flown on the US Shuttle STS116 in December 2006. The research was to observe long-term spaceflight (more than 6 months) on C. elegans after many generations. UMBI is also collaborating with the National Space Agency (ANGKASA) to find out the effects of microgravity on C. elegans, which is why they need the simulator as soon as possible. The UMBI space research is being led by Prof Datuk Dr A Rahman A Jamal with Dr Neoh and six others in the team.